In China, there lies a famous training springs, a place where martial artists can hone their skills to great levels. Unfortunately, the springs are also cursed! 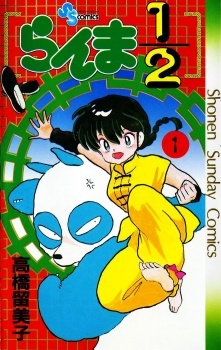 Teenage martial artist Ranma falls into the “spring of drowned girl” and now changes into a woman every time he’s splashed with cold water. That doesn’t stop his father from engaging him to Akane, the daughter of an old friend and a tough girl who has better thing to do than worry about boys. But Akane isn’t the only girl who has a chance for Ranma’s affections—two other girls have also been betrothed to him. But Ranma has better things to do than worry about his love life—such as making a plethora of crazy rivals and even more suitors!